If you search for a broad topic like [love], [global warming], [censorship], [North Korea], Google shows 3 in-depth news articles at the bottom of the first search results pages. It's an effort to go beyond promoting recent news articles and reward news sites that write detailed articles and in-depth analyses. 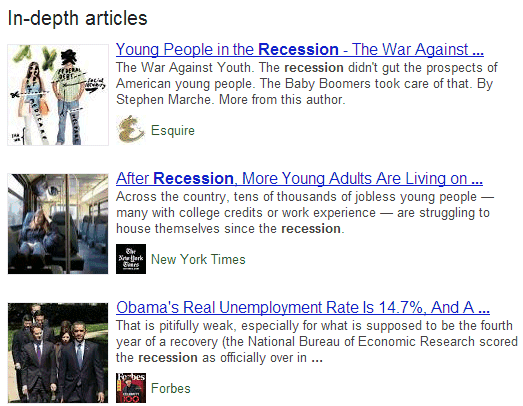 Here's an example for [recession]: 3 long articles from Esquire, New York Times and Forbes. 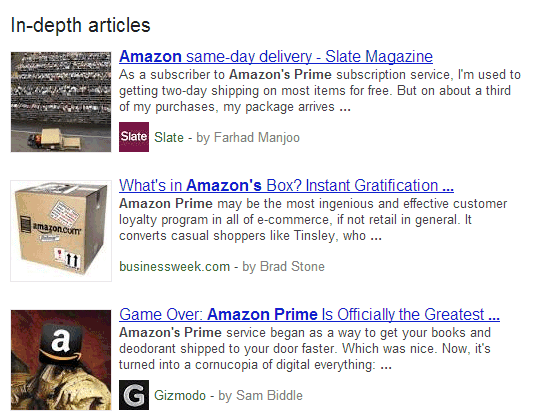 The results for [amazon prime] include a Gizmodo article. 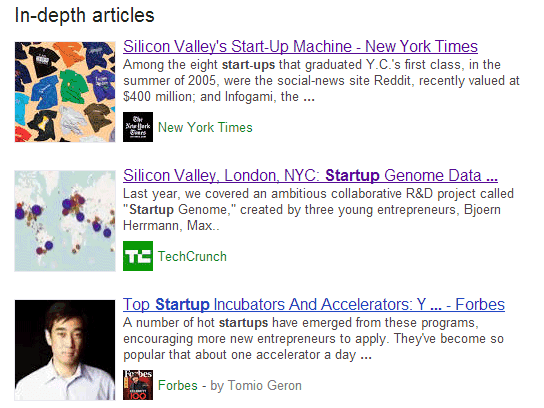 The results for [startups] include a TechCrunch article from April 2012 about the top startup ecosystems. 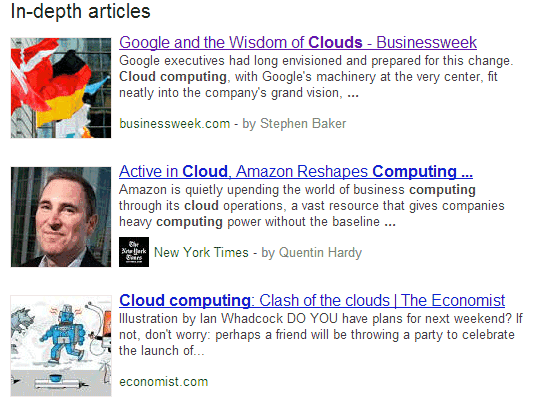 The first in-depth result for [cloud computing] is a 2007 Businessweek article about Google. It's called "Google and the Wisdom of Clouds". "To understand a broad topic, sometimes you need more than a quick answer. Our research indicates perhaps 10% of people's daily information needs fit this category - topics like stem cell research, happiness, and love, to name just a few. (...) I'm happy to see people continue to invest in thoughtful in-depth content that will remain relevant for months or even years after publication. This is exactly what you'll find in the new feature. In addition to well-known publishers, you'll also find some great articles from lesser-known publications and blogs," says Google's Pandu Nayak. There's a help center article that offers more information about this feature. "While the feature is based on algorithmic signals, there are steps you can take as a webmaster to help Google find your high-quality, in-depth content and best present it to users in the search." Google suggests to use schema.org article markup, Google authorship markup, logos and content that can be accessed without subscription. Google News has a similar section that's called "spotlight", but it only includes recent news articles. 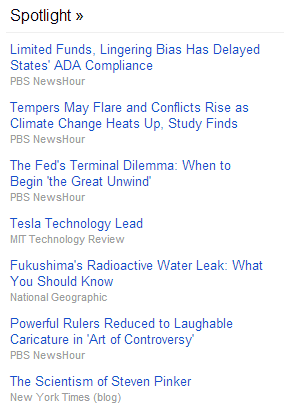 "The Spotlight section of Google News is updated periodically with news and in-depth pieces of lasting value. These stories, which are automatically selected by our computer algorithms, include investigative journalism, opinion pieces, special-interest articles, and other stories of enduring appeal. To access the stories in this section, just click Spotlight on the left side of the page."